We might only be a few days removed from World Backup Day 2019, but the idea that 65% of consumers confirmed they suffered data loss (as revealed in our annual survey of attitudes and habits about data protection) has been rolling around in my head ever since. After all, that’s nearly 30% more people who reported they or a family member lost data in 2018 – a significant jump. The fact we all use more data and we’re accessing that data on more devices makes it obvious that we’re also creating more opportunities to lose that data – so that increase is understandable. But we still can take steps to try to reduce the frequency of data loss despite the increase in volumes and devices. It seems now is a great time for a reminder about the steps needed to keep your data safe. The following five recommendations are designed to help you negotiate the modern risks to your data given today’s habits of data use and the ever-evolving threats that lurk online. When you lose data, you want a quick, reliable way to get it back – and that’s what local backup delivers. Copying files to hard drives, USB flash drives, external drives, tape, or other devices attached to individual systems or devices connected via a local or wide area network is a fast and easy way to ensure you have what’s needed to restore any file, app or system. “Don’t put all your eggs in one basket” applies to data too. 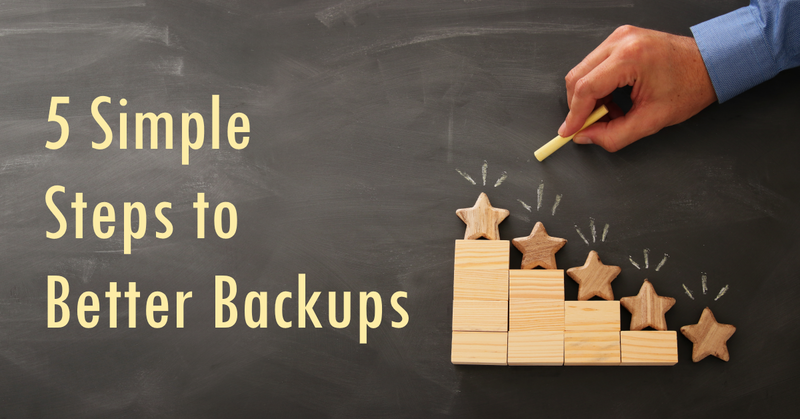 Cloud backups provide the redundancy needed to ensure your data is always safe – even if a fire, flood, network-wide malware attack or other threat destroys both your original files and local backups. Plus cloud backups not only isolate your data from local threats, but they also give you the ability to access your files from anywhere. Historically backups allowed you to restore your system following a ransomware attack without having to pay the criminals. Now crooks target backup files to keep you from bypassing their attacks. Only Acronis delivers secure backup solutions featuring an integrated, AI-based anti-ransomware defense that stopped 400,000 attacks last year and automatically restores any affected files. Data tampering is a growing threat, so it’s critical that you know your documents, files and backups are safe from unauthorized changes. Only Acronis offers backup solutions that put the power of the blockchain in your hands – allowing you to notarize files to prove they are authentic and unchanged or have users electronically sign documents in a unique, verifiable way. Online attacks are growing in complexity, but you can easily strengthen and simplify your defenses simultaneously. Windows Defender, Microsoft’s built-in anti-virus, provides traditional signature-based protection, while Acronis’ modern AI-based anti-ransomware tech effectively stops zero-day attacks that can be missed by signature-based defenses. Running these two solutions protects you from everything – even malware that’s never been seen before. Numbers don’t lie, which is why seeing a 29% increase in data loss incidents shouldn’t be ignored. And while more people are claiming to back up their data, gaps in their protection can form if individuals and businesses don’t adjust their backups to reflect the changing ways they use, store, and access that data. With these five simple steps, you’ve got the numbers you need to stay true to your data protection plan. Turning that into reality simply means deciding if you need a personal solution like Acronis True Image or a business solution such as Acronis Backup.